I have circled this story again and again in my life. I try to write about it. John Carter comes out this Friday and I’m going to go see a morning or early matinee showing. I’m going to play hooky from my day job. I don’t know how I’m going to do this because I’m booked all day with meetings, but I will. When I was 13 my best friend was hit by a train and lost his life. It was an accident but no one knows what happenned. No one – not even me. It is a mystery shrouded in a thunderstorm, black skies, and torrential rain.From that day on I picked up Edgar Rice Borroughs’ books from a local stationary store – Wientraubs – and started reading them. Before that moment I was a reader but not with the same intensity, the same desire to disappear that I had after my friend was killed. When I ran out of the titles that Wientraubs carried I went to Walden Books and BDalton. This was long before superstores had taken over the landscape. I read and read. Reading didn’t bring my friend back, but over time it made the pain less. The first ERB I’d found was The Gods of Mars the second book in the John Carter series. At the time I didn’t know it was a series. All I saw was the incredible Frank Frazetta cover and knew I had to read it. It had been published originally in 1918 but this edition – from the 70’s – had Frazetta’s muscular artwork in line drawings all through the narrative. The scene that captured my imagination – and captures it still – is the opening. 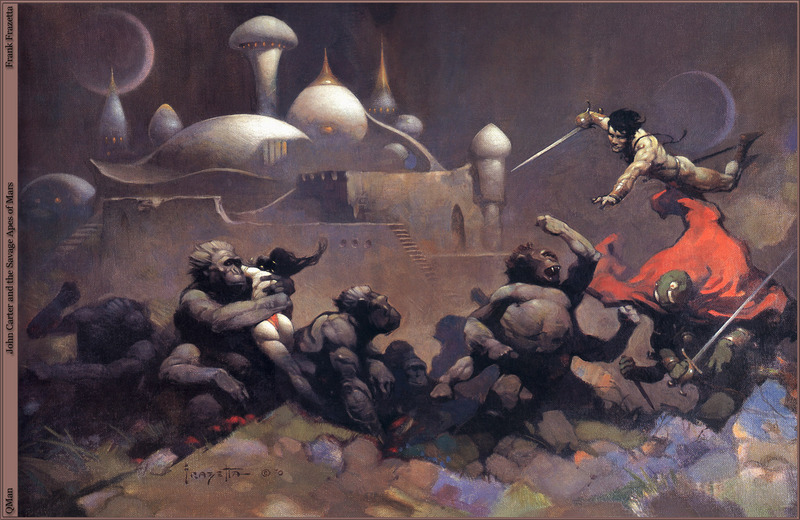 John Carter raises his arms to the skies, looks up at the Red Planet and wishes for it to carry him across the cosmos. I’ve waited 37 years for a movie to come out telling this story and this Friday it appears in movie theaters near you and me. I’ve got issues about John Carter. I circle around them, though not as much as I used to. They form the landscape of each of our own individual planets. They fan the desire to help others transport to worlds they’ve never even dreamed of – even if the world is just like the one they exist in now. Maybe I’ll see you there – in the darkness of the movie theatre. This entry was posted on March 6, 2012 by Joe Lunievicz. It was filed under Blog, John Carter of Mars, Middle School, On Writing, Reading . I hope it lives up to everything you’ve dreamed of, Joe. what do you think of the trailers so far? I’ve been looking forward to this movie for a while, but there are some things that make me feel apprehensive. The white apes, for one thing. No one I know even knows what John Carter is, not even a person at my local bookstore. So I can’t really discuss how the movie is going to be. What is your opinion of it based off the trailers?